Welcome to the updated webpage of Laura Feeleus. Her solo show at Martin Batchelor Gallery happened exactly two years ago. This update webpage shows her new works and installation pieces with the artist on site. 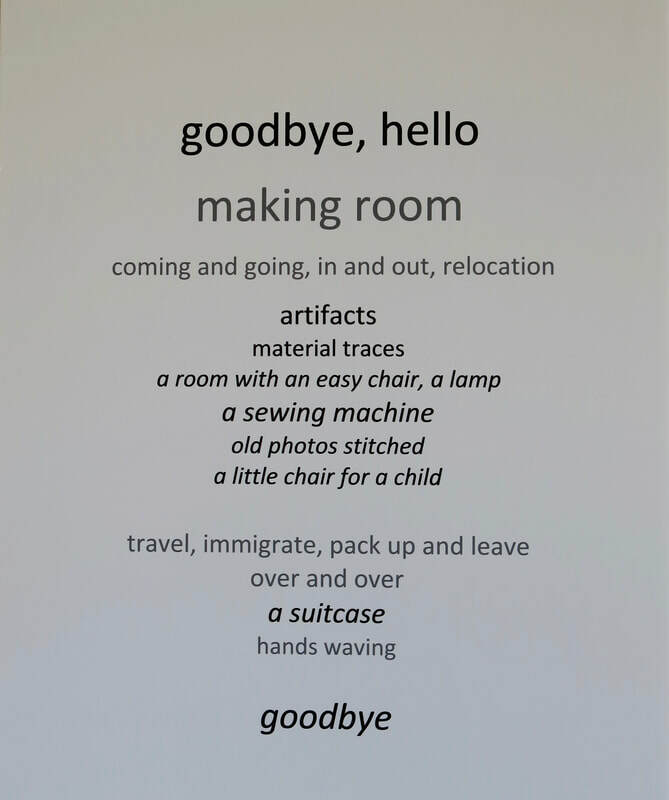 Laura’s exhibition titled “goodbye...hello” runs July 6-22 at arc-hive. 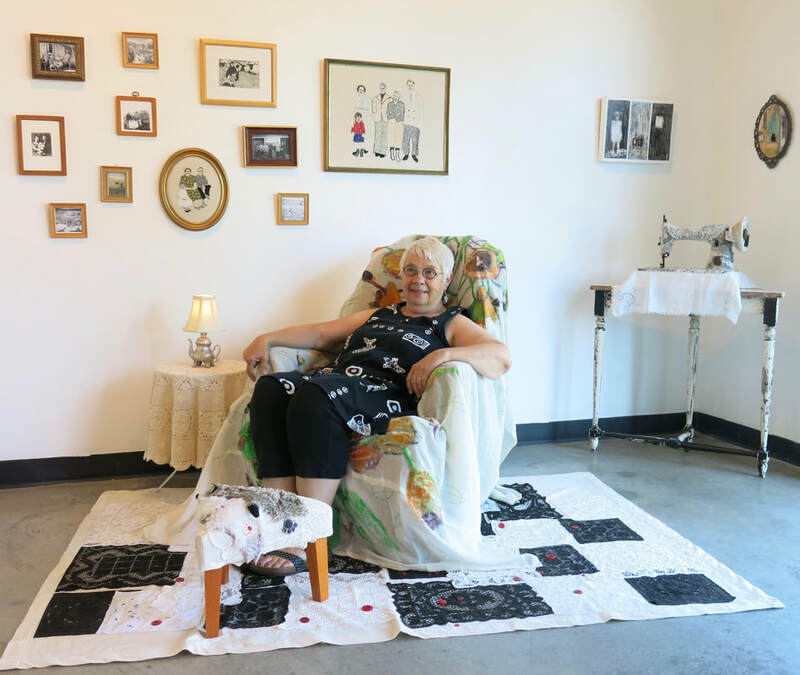 Arc-hive is an artist run centre, located at 2516 bridge street. 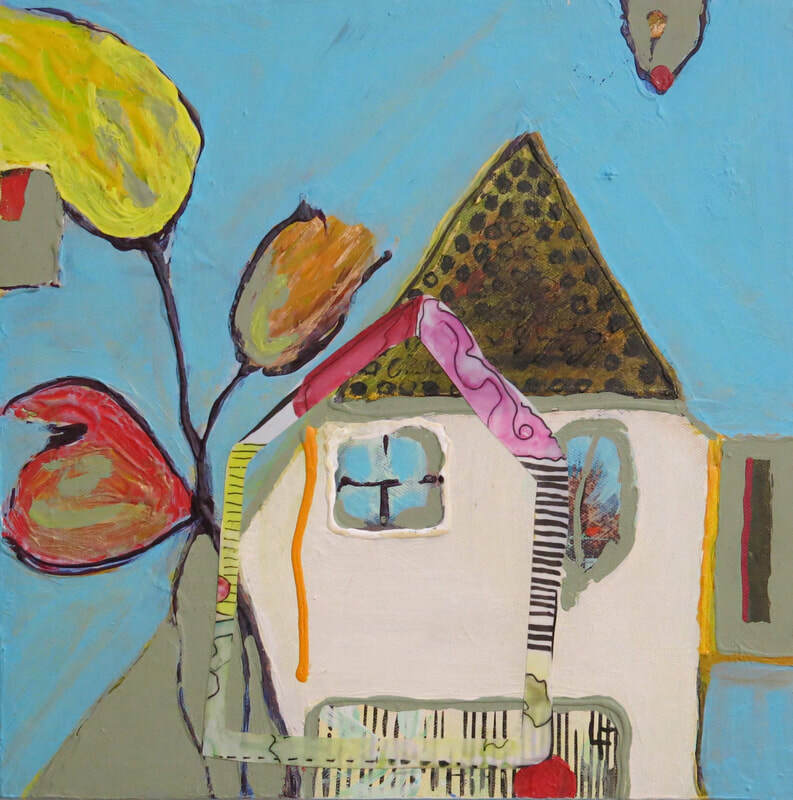 Kindergarden I, acrylic & mixed media on canvas, 10.5 x 10.5 in, 2018. Abundance of Thrift, hand-stitched vintage linen, 32 x 42 in, 2017-18. Bellis Domestica, acrylic on canvas, 24 x 31 in, 2018. Suitcase of Goodbyes, sculpture using found objects, 18 x 24 in, 2017. Haute Couture, 24x24 in, oil & cold wax, mixed media, 2016. Looking closely at Website (above) shows the variety of methods and media employed. The challenging medium of encaustic (tinted molten wax) creates the layers of pigment. Pages from a book are adhered to the cradle board, with some words circled. Random numbers and hand-written lists encourage the viewer to zoom in and investigate. (The artist’s love of text could be linked to her Library Science degree from the University of Alberta.) Grid patterns, rectangles and squares emerge from a ghostly ochre-layered background. Three squares of the quadriptych are connected loosely with a dark uneven line. An oblong insect body and red square connect the eye through colour association. Feeleus’ painting career was boosted by a Cold Wax Oil Painting workshop with Lisa Pressman in 2015. Pressman is a well-known abstract artist with thirty years experience in various styles. Cold wax mixes Gamblin Artist Oil Colours with a waxy substance. The result is a rainbow of hues the consistency of icing. “The way this paint layers is remarkable,” she says, “I had an aha! moment about technique and renewed confidence in my abilities.” Her technique now includes sgraffito, the process of scraping back layers of paint with various tools. All this activity requires a strong working surface that the artists finds in cradle boards (reinforced wooden structures). The finished edges of the cradle boards lend a sculptural element to the artworks, which echo her contemporary textile work with the Surface Design Association. ​Leslie McBain is drawn to the sombre and mysterious tones in these two acrylic paintings. She’s intrigued by the ghostly figures and edgy mood. Leslie and Laura became friends while working on the Hope Bay Store rebuild on Pender Island. This community restoration project began in 2003 and won an award upon completion. “I am so impressed by Laura’s wonderful series of paintings,” says Leslie. Colleen Kerr is a graduate of the Alberta College of Art and Design with a wealth of experience in painting, text and fine art jewelry. She appreciates the truth and sincerity of Laura’s paintings. 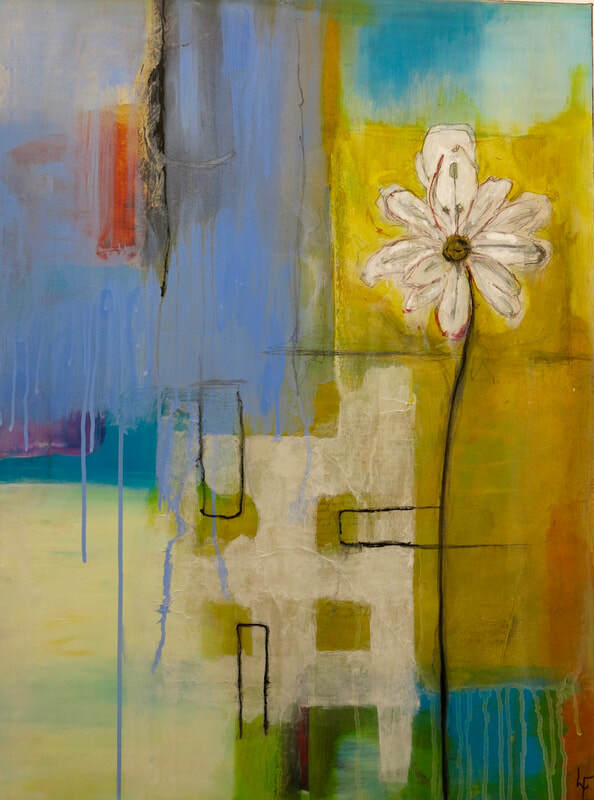 “On the surface they appear clear,” she says, “but looking closer, many layers and complexities unfold.” Colleen appreciates the textural relationships and diverse mediums used by the artist to engage the viewer and tell stories. 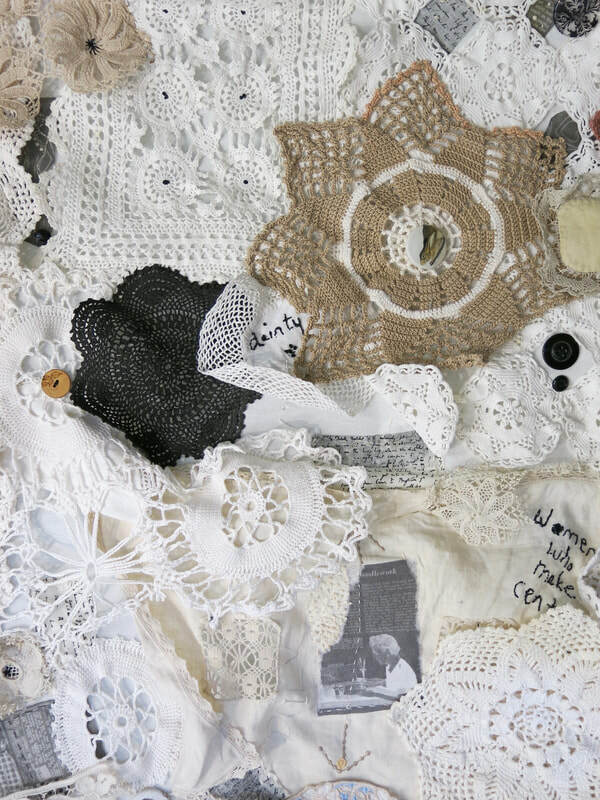 In this painting Lesley sees patterns found in Laura’s textile work. “Some textured areas look like cloth,” she says, “while others appear cut away, then stitched back together.” The hot colours and heart shape in the painting sing out with love, she notes. And the generous proportions of the painting convey lots of warmth. ​Friends and family gathered at the Martin Batchelor Gallery to celebrate Laura’s successful exhibition on July 30. The party was hosted by Terry Loeppky and Dorothy Rich, and catered by Juma. Wendy Welch, Director of the Vancouver Island School of Art (VISA) spoke on the importance of art education in our lives. A portion of sales during the evening went to support VISA. Mike Fooks, son of Laura Feeleus and Court Fooks. She has a History in Art degree and Public Relations certificate from UVic. ​reproduction of photos or text.